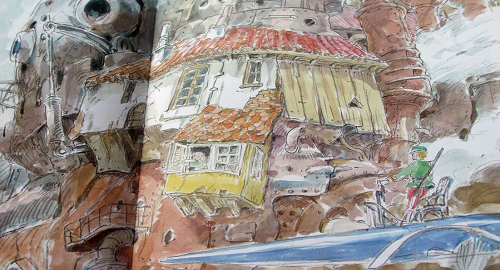 The Art of Howl's Moving Castle is a collection of sketches, drawings, and full-colored pages of scenes and characters from the movie. You can see the development of the art uncover before your eyes. 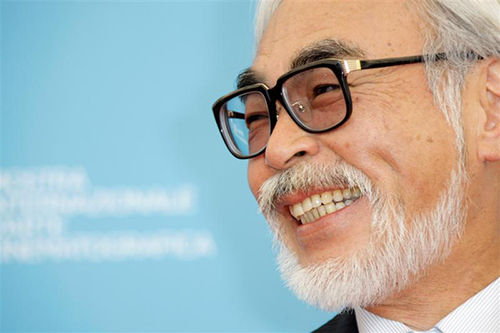 Hayao Miyazaki is known for his unique style of art. 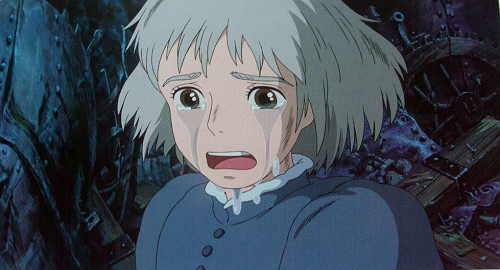 He is said to be responsible in making the rough sketches for Howl no Ugoku Shiro (Howl's Moving Castle). Most all of the concepts for the motion picture are based on his initial drawings. 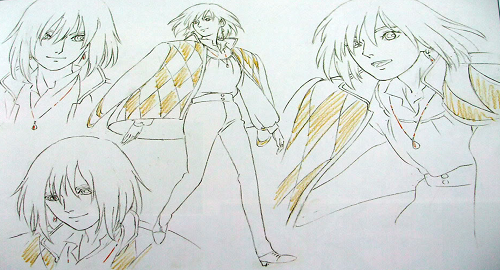 This is one of the first sketches of Howl. This is the face that captured the hearts of many women, both in the movie and in the real world. His smile could melt any heart. 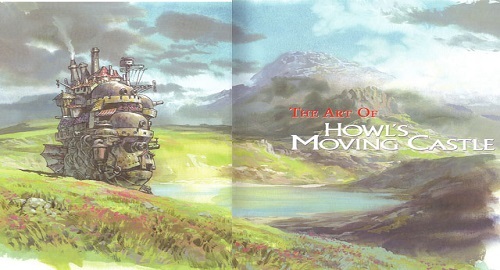 Yoji Takeshige and Noboru Yoshida supervised the concept, character, and background design of Howl no Ugoku Shiro. Their team put life into the film. Sophie’s garden would never look as enchanting without the lines, shadows, and colors that clothe it. Who could forget Sophie’s hat shop? It’s the place where her adventure began. This shop, with its colorful walls, is in contrast with the bleak town. 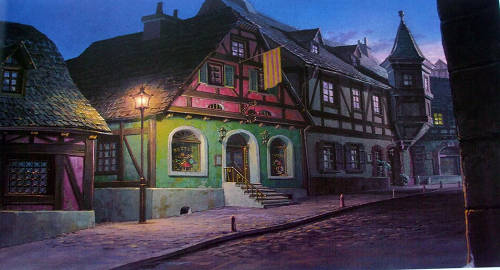 The buildings are drawn in a European style, as the story, based on an English novel, is set in Europe. 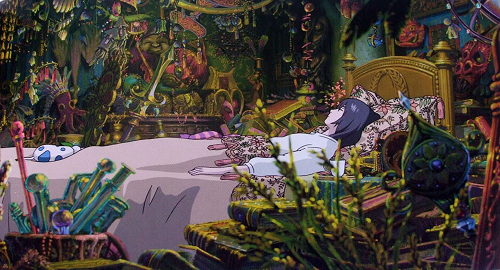 Then there’s Howl’s room, mysterious and full of all things glittery and misplaced. How many things can you spot from this shot alone? If this is not enough proof of the infinite patience artists put behind the film, then I don’t know how else to convince you. Who knew one could spill so many tears? Apparently, one is entitled to exaggerating scenes for art’s sake. We can also admit that Sophie’s beauty amplifies when there’s compassion in her eyes. This is one of the best still shots from the film. 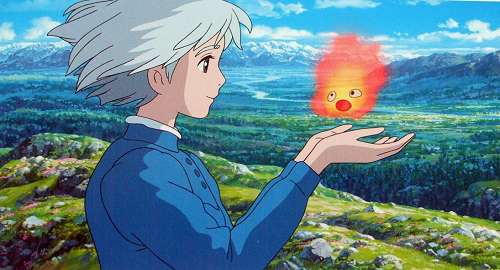 Sophie’s happy, contented face staring at Calcifer complements the serene background beautifully. 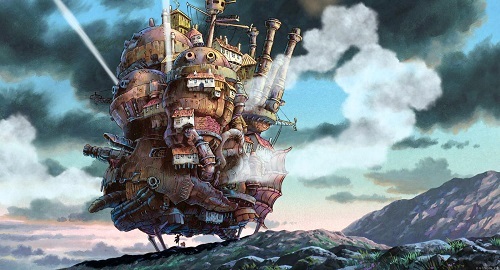 Finally, what would the Howl no Ugoku Shiro without Howl’s castle? 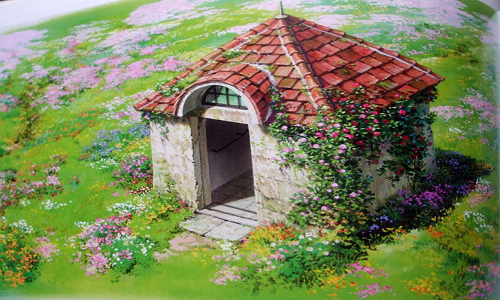 With its intricate details, the castle itself is the epitome of excellent artistry displayed once again by Ghibli. All this said, there's no doubt that Howl no Ugoku Shiro is a true work of art that will leave its mark in the industry forever! Princess Mononoke, directed by Hayao Miyazaki, is a classical anime film that represents the struggles between human beings and nature. This movie is full of incredibly beautiful art, inspired by real places and also tales from different kinds of folklore. Let's take a closer look!